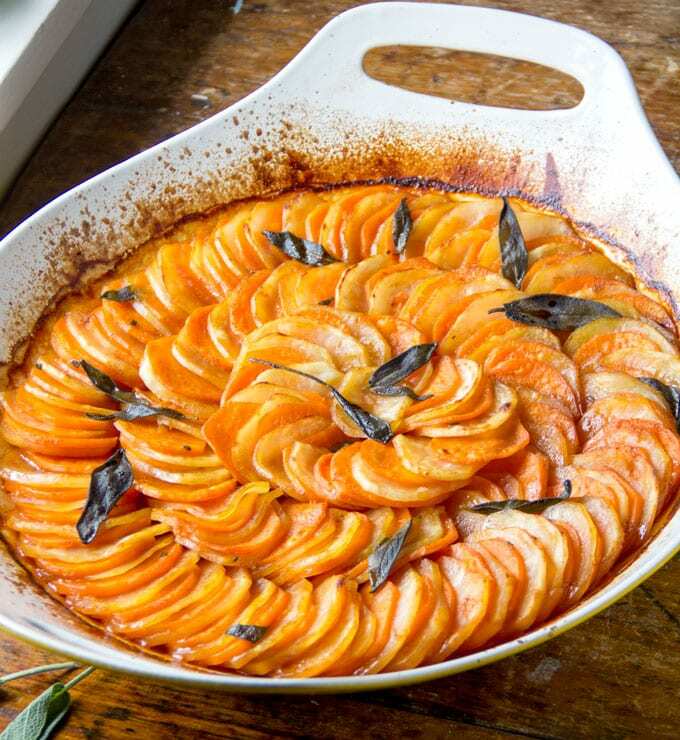 Here’s a beautiful side dish for a special occasion: Russet and Sweet Potato Tian with Brown Butter, Apple Cider Syrup, and Sage. Welcome to #PotatoPalooza day one! I’m excited to announce that all this week I’m partnering with two talented food bloggers ~ Elizabeth at Bowl Of Delicious and Maggie at Omnivores’s Cookbook ~ to bring you 15 fabulous potato recipes for the holidays. We’re calling the event #PotatoPalooza. The definition of ‘palooza’ is “an all out party.” #PotatoPalooza is a 5 day celebration of great potato recipes across our three blogs. Because each of us has our own unique blog mission, you can look forward to a diverse assortment of delicious potato recipes. Elizabeth at Bowl Of Delicious shares real food for busy people, with lots of quick, easy, make ahead, and freezable dishes. Maggie at Omnivore’s Cookbook shares Chinese and Asian recipes, designed for the home cook. Panning The Globe’s mission is to share the most delicious recipes in the world, that we can all cook at home. Many thanks to the Idaho Potato Commission for sponsoring this post! As always, all opinions are my own. A ‘tian’ is the name of a a layered vegetable casserole as well as the vessel it’s cooked in. The dish originated in Provence, France. You might remember the tian that was made famous in the movie Ratatouille. Tians like that, and like this russet and sweet potato tian, are decorative and require some finessing. But if you have the right tools, you’ll have the potatoes sliced and arranged in no time at all. The most important thing is to cut the potatoes into very thin rounds. It’s difficult and time-consuming to do this by hand. A mandolin slicer will work. But my favorite method by far, is to use the slicing attachment of a food processor. 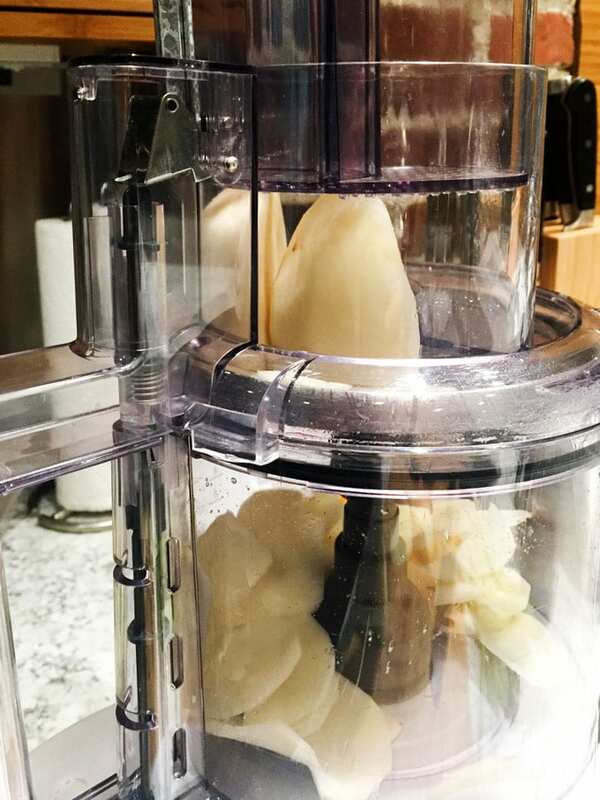 You may have to shave the potatoes down a bit with your potato peeler, to get them to fit into the feed tube of your processor. But then you can slice all the potatoes for this whole tian in about 3 minutes flat. Keep potatoes fresh in a bowl of water with a splash of vinegar. Dry them and arrange them in stacks in your hand. Lay the stacks on their side and keep them going around the perimeter of the casserole, like a long potato slinky. When all the potatoes are in the casserole, or as many as can fit, you can adjust them to the size of your pan. If the casserole is tightly packed, the potatoes will stand vertically. If you have a very large casserole (as I do) you can fan the potatoes out a bit so they lay out more on their sides. 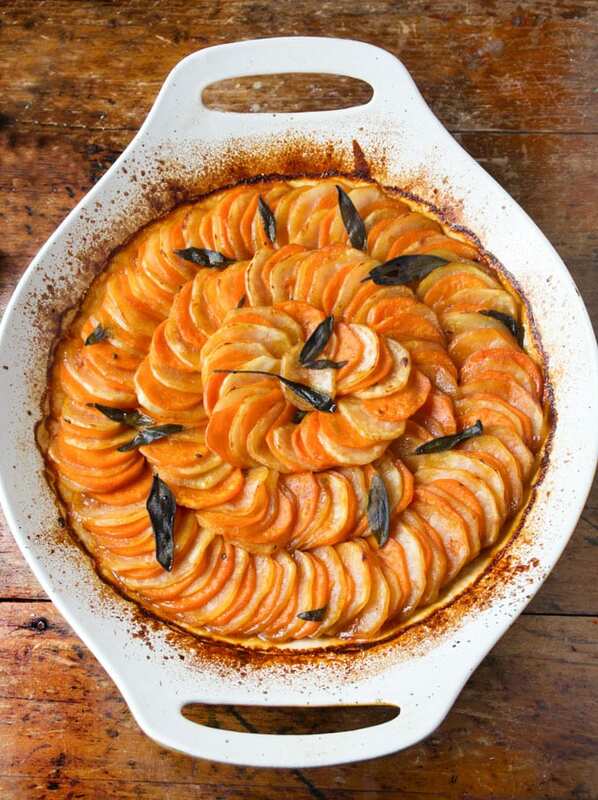 Then pour the brown butter and apple cider syrup mixture over the tian; decorate the top with sage leaves; cover with foil, and bake. Potatoes are the most amazing food in the world. They’re cheap, healthy, nutritious, and there’s no limit to the delicious dishes you can create with them. Call them a side if you want, but at my holiday table the potatoes often steal the spotlight. This two potato tian is so pretty, you might even want to make it your table centerpiece. Special thanks to The Idaho Potato Commission for sponsoring #PotatoPalooza 2016! For more delicious potato recipes and to find out everything you’ve ever wanted to know about potatoes, visit The Idaho Potato Commission Website. 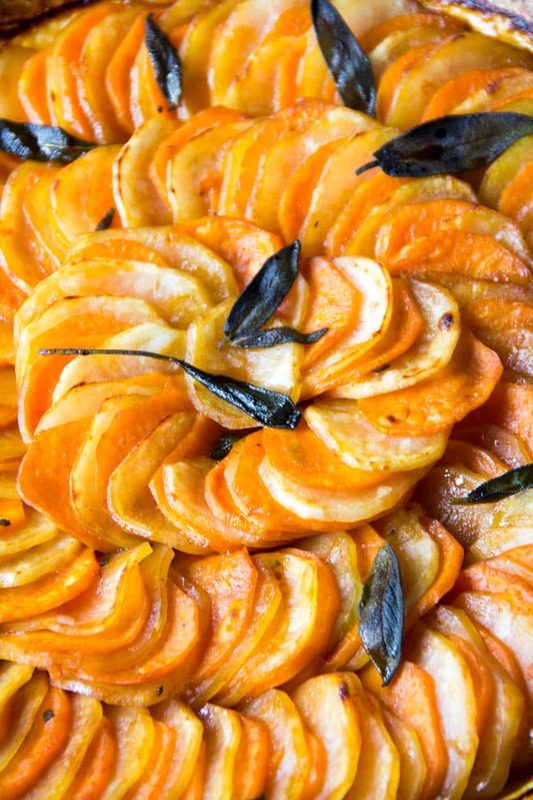 Here’s the recipe for Russet and Sweet Potato Tian with Brown Butter, Apple Cider Syrup, and Sage. Hope you enjoy! 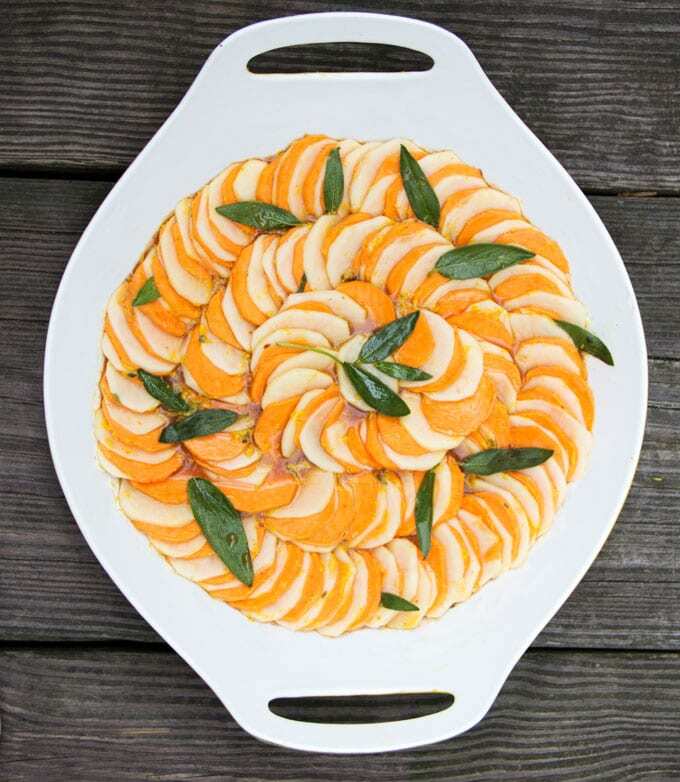 A decorative and delicious casserole of sweet and russet potatoes. 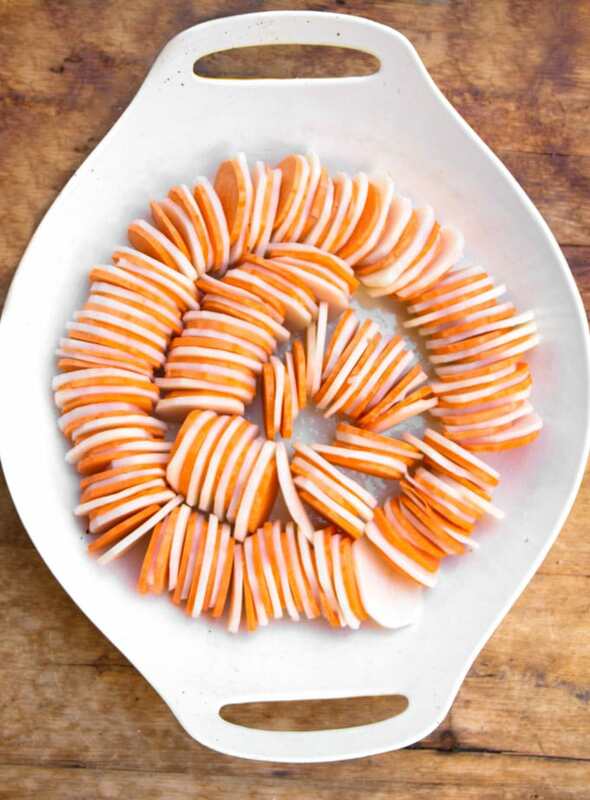 A beautiful side dish for a special occasion. Preheat oven to 375ºF. Arrange rack in the center of the oven. Fill a large bowl halfway with cold water and 1 tablespoon vinegar. Coat bottom and sides of a large (4 quart or larger), preferably round, casserole-dish, with butter or oil. Sprinkle 1 teaspoon of salt evenly over the bottom of the casserole. Make brown butter: heat the butter over medium heat in a medium saucepan (preferably light colored so you can see when it browns) When it starts to foam watch it carefully, whisking frequently. It will start to darken. When it turns from golden brown to dark brown and has a nutty aroma, remove it quickly from the heat. In a medium bowl whisk the cider syrup, balsamic vinegar, 2 tablespoons oil, chopped sage, 2 teaspoons salt and ½ teaspoon pepper. Pour the mixture into the pot with the brown butter and set aside. 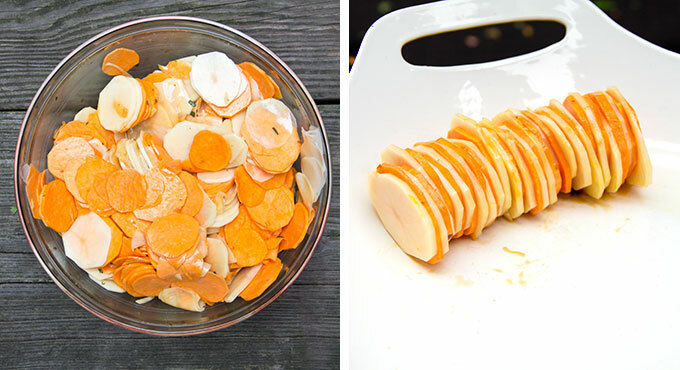 Peel and cut the russet potatoes and sweet potatoes, crosswise, into thin rounds, about 1/8 inch. I suggest using a mandolin slicer or food processor with the slicing blade attached. Transfer potato slices to the bowl with water and vinegar, as you cut them, to prevent discoloration. Place a dishtowel on your work surface. Pull a handful of russets slices and a handful of sweet potato slices out of the water and lay them on the towel. Blot them dry with a second towel. Arrange a stack of alternating white and sweet potatoes in your hand. Set the stack on its side in your casserole, like a long caterpillar. Lean a cup or bowl against the slices to keep them vertical, as you work. Repeat with remaining slices, winding the caterpillar around the perimeter of the casserole. Continue by creating an inner circle and then an even smaller one, if there’s room, until you’ve either filled your entire casserole or run out of potato slices. Adjust the rows of potatoes depending on the size of your casserole. If it’s small, the slices will be straight up and down. For a very large casserole you can tilt the slices and spread them out more. Heat the cider-butter mixture until it starts to simmer. Give it a whisk, and pour it evenly over the potatoes. Rub the sage leaves with a little olive oil to coat them, and then arrange them, decoratively, on top of the tian, pressing them down against the potatoes. If they stick down they’re less likely to curl. Sprinkle 1 teaspoon of salt and a few grinds of pepper over the tian. Cover the casserole tightly with foil and bake in the oven for 30 minutes. Remove the foil. Cook the tian, uncovered, for 40-60 minutes longer, until the potatoes are cooked through and starting to brown on the edges. Cooking time will depend on the size of your casserole and how tightly packed the potatoes are. To Serve: Serve hot or warm. This was so unappetizing – appearance, texture, and taste that I’ll never attempt it again. Disappointing ! The taste of balsamic (good quality Italian Modena) overrode everything else – made it dark and unattractive as well. There was way too much liquid and I even poured it off before the final oven period. Making the syrup took too way too long to make the whole undertaking worthwhile. Next time I will follow the KISS principle; olive oil, herbs, potatoes, salt and pepper. Oh no. I’m so sorry your Tian didn’t turn out well. Thank you for the feedback. It’s a complicated recipe with lots of factors that might impact the outcome – different ovens, cooking vessels, etc…. I’ll review the recipe and see if I can make some suggestions to avoid what happened to you. What does the vinegar actually do for the tian? I’m asking about the cooking process, not the taste. I’ve seen vinegar also used in another potato recipe and now I wonder if there’s something I need to know about what the acidity does to the starch. Can I substitute maple syrup for the apple cider syrup? Maple syrup is sweeter than cider syrup so I would suggest diluting the maple syrup with a little lemon juice, until you get a sweet and tangy flavor that you’re happy with. You might also want to simmer the maple syrup until it reduces and thickens a bit. Then I think it would work really well! I hope you’ll try it and let me know how you like it! This is a very beautiful dish and actually rather easy to put together if you have a food processor. It seems like a perfect part of a special holiday menu. Just love the brown butter and sage!!! Wow- this is absolutely GORGEOUS! It would make such an impressive holiday dish. 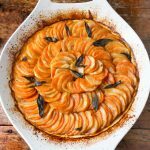 Love that you used white and sweet potatoes- it’s the best of both worlds (and you don’t have to decide whether to have sweet potatoes OR white potatoes OR two separate dishes- the hardest Thanksgiving decision in the world!). And the sage leaves with the orange potatoes is just so pretty. Can’t wait to try this one!